Samsung unintentionally tattled the processor info for T-Mobile's Galaxy S II model. 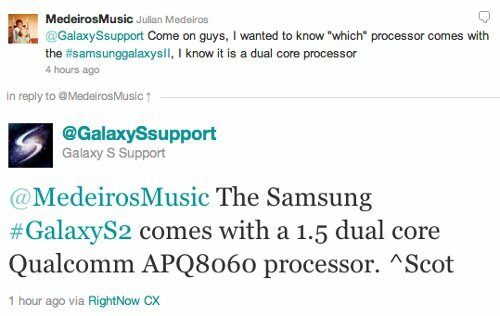 It seems that Samsung’s Twitter account, @GalaxySsupport, accidentally revealed the type of processor that will be included on T-Mobile’s upcoming variant of Galaxy S II. Anyway, this unintentional revelation would not be considered as a “confirmation” from Samsung, since they haven’t publicized any official reports with regards to this matter. The 1.5GHz Qualcomm APQ8060 processor has been speculated as the possible replacement for T-Mobile’s Samsung Galaxy S II’s Exynos chipset.